To be honest, we had a rather bad dining experience here. I don't know if it's just our luck that we happened to order the wrong stuff, or we had our expectations too high, but we didn't enjoy our dinner at all. I thought the beef burger was alright. 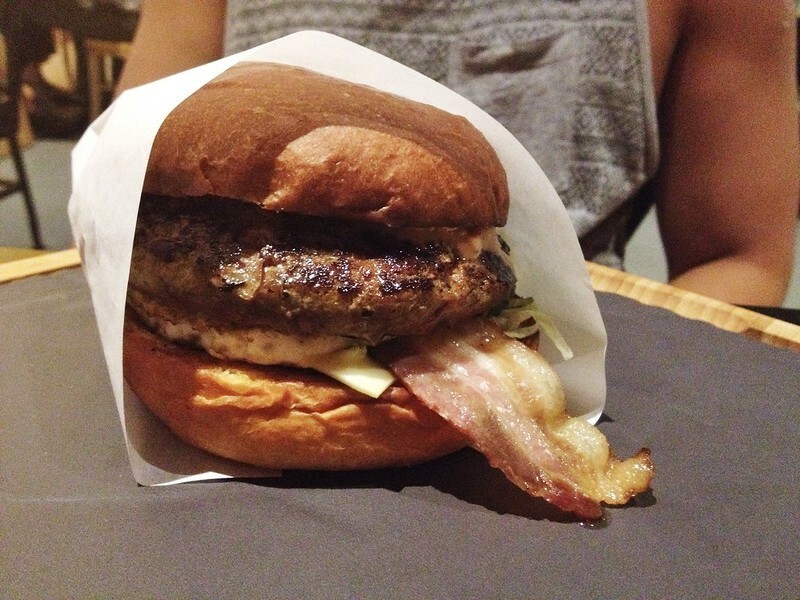 The patty wasn't exceptionally juicy nor bursting with flavour, but it wasn't tough and dry. S didn't like it though. Then again he doesn't like Shiok Maki because he hates sashimi, so... hahaha. 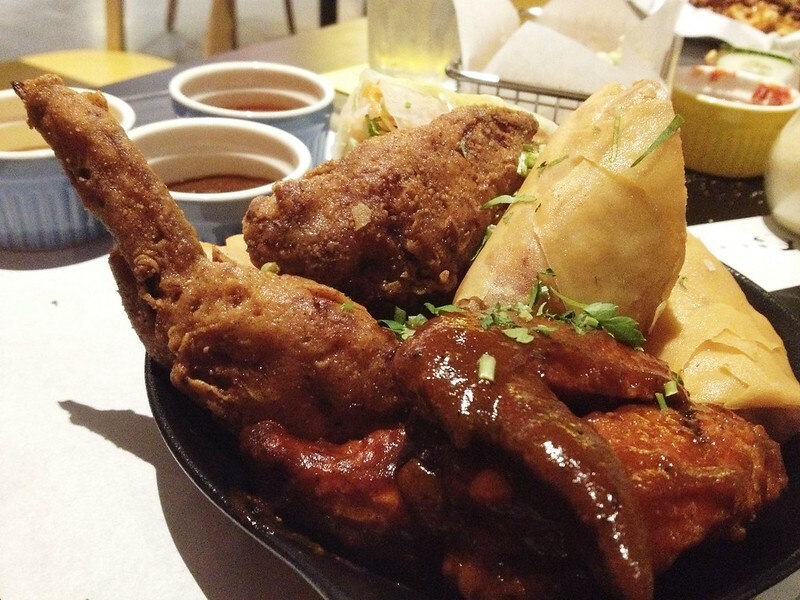 We had the Sampler Trio Wings since we couldn't decide which wings to get. This dish was a disappointment, and totally not worth my money. 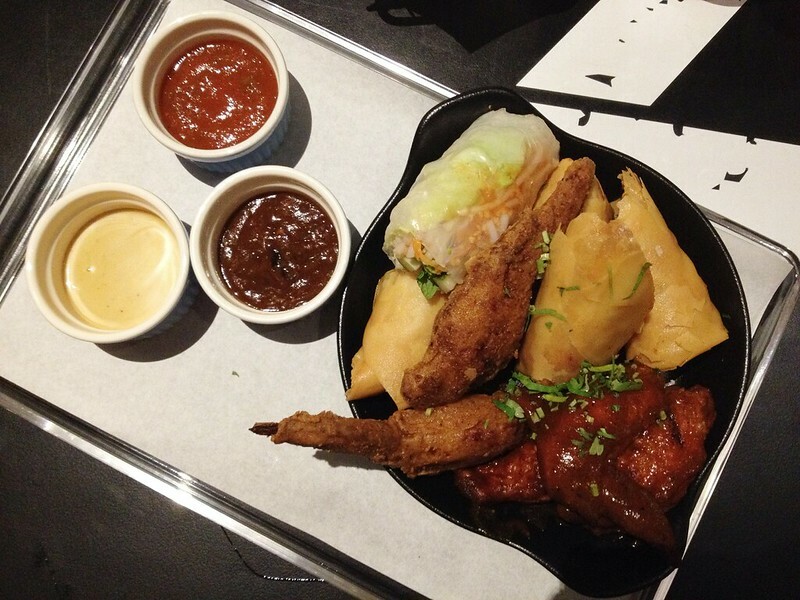 The Cajun BBQ wings, Wings Wrap, and Jambalaya Wings were nothing special, and the Vietnamese spring roll clearly didn't belong there. 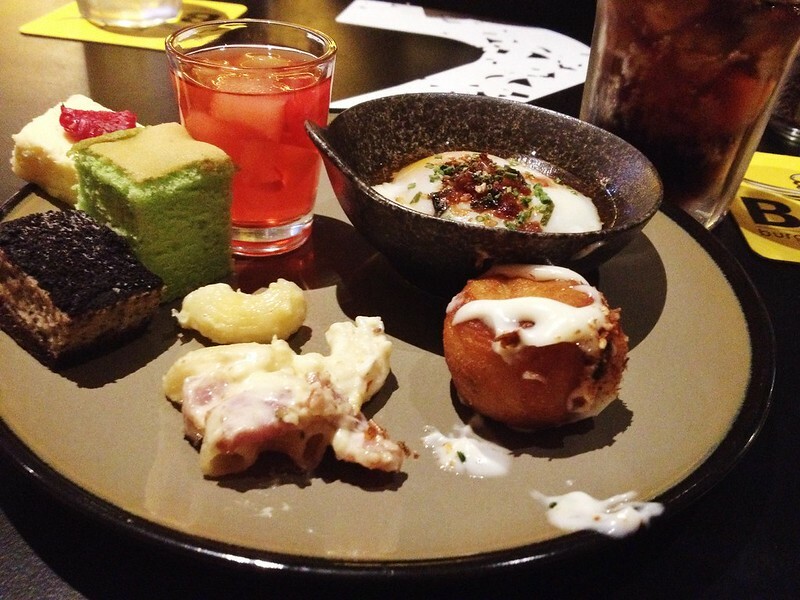 More than half of this dish was left untouched because it wasn't appetising. 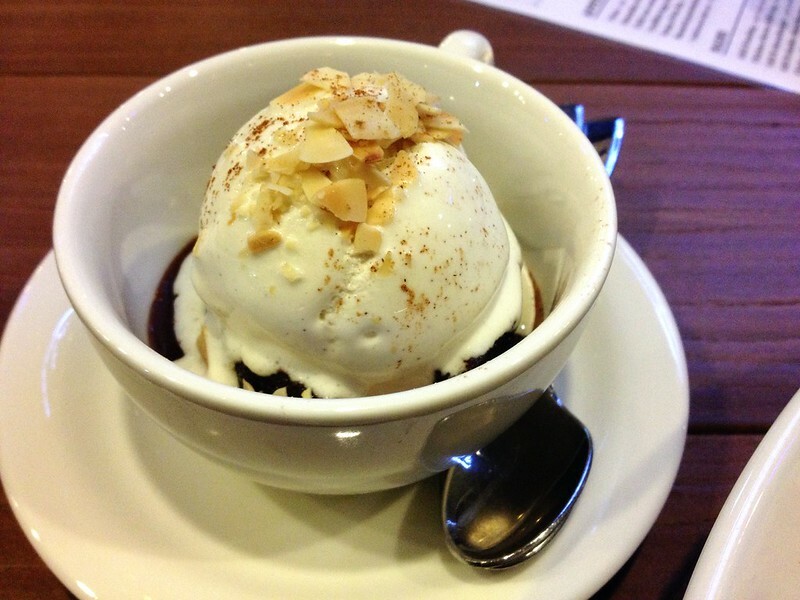 We also topped up S$7.90 each for their mini taps and dessert buffet. The mac and cheese was probably the best of all. Others were okay, but the cakes were really dry. 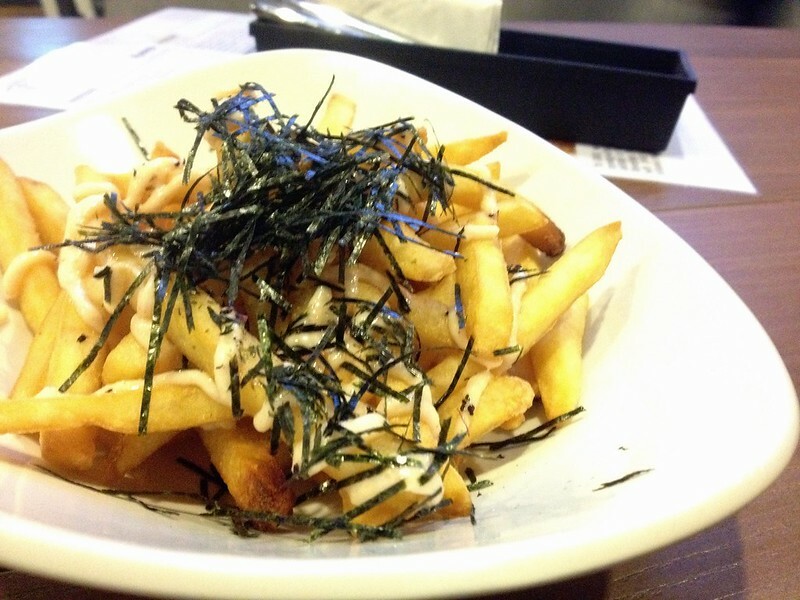 Mentaiko Fries (S$9) || Topped with mentaiko aioli, nori seaweed. More mentaiko aioli was served at the side, so it isn't as little as it looks. I wiped this dish clean. Anything mentaiko is good, right? S is not exactly a fan of this though. 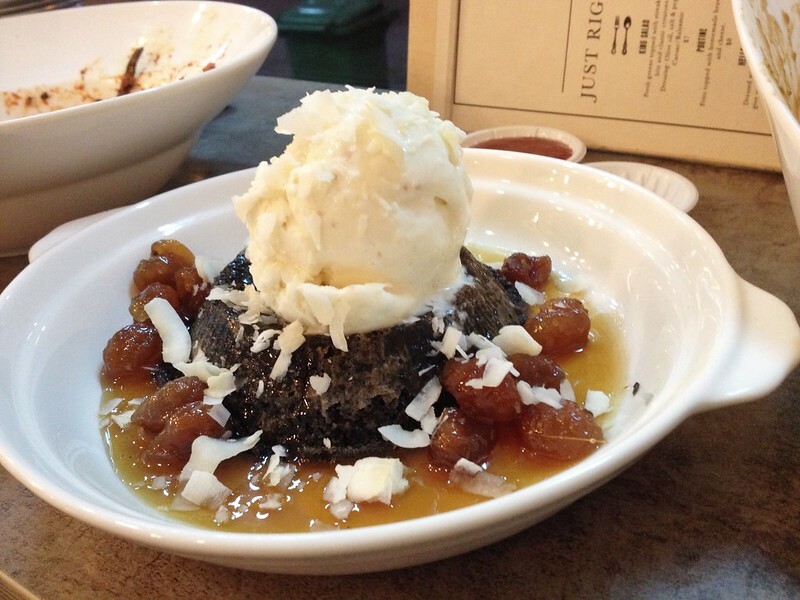 Sticky Date Cake (S$8.50) || Served with burnt caramel, french vanilla gelato, toasted almonds. 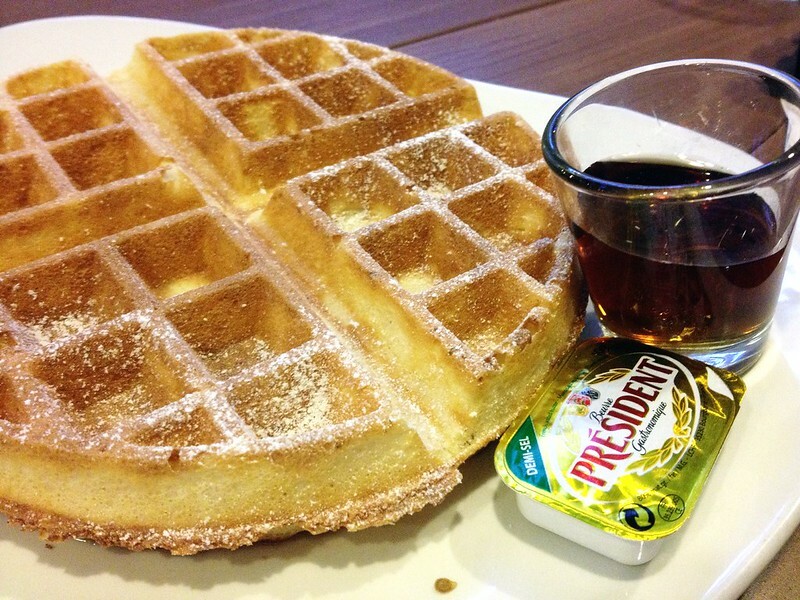 Belgium Waffle with Butter, Maple Syrup (S$6.50) || I didn't like it. 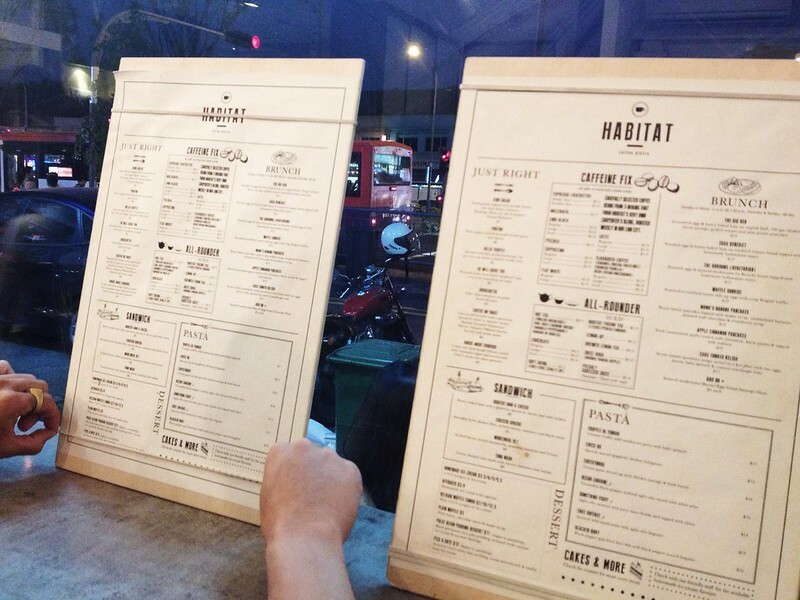 We had been there once, and decided to drop by again since they have expanded their menu! This place is always so crowded! 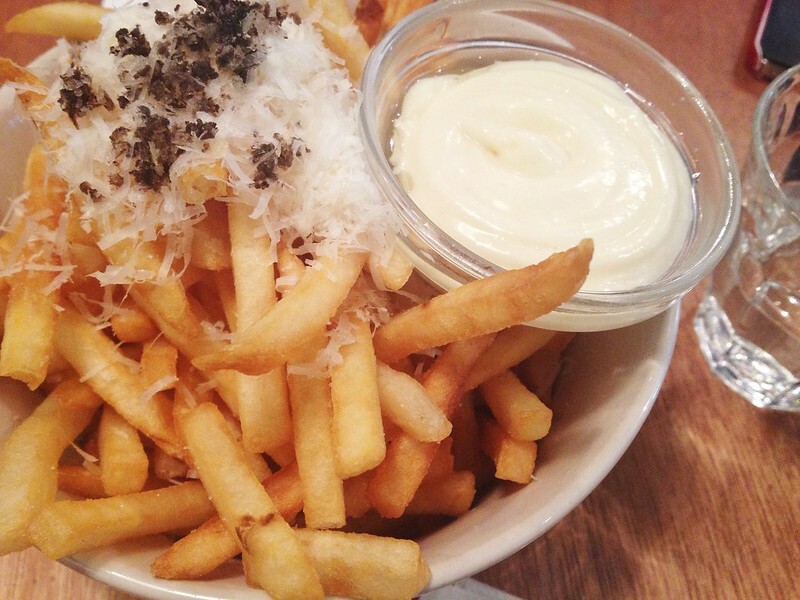 Truffles Fries (S$12.90) || With freshly grated truffle, truffled aioli, parmesan, and sea salt flakes. One of the best in town, apart from the one at Chillax! It gets very salty towards the bottom though, but I like it! 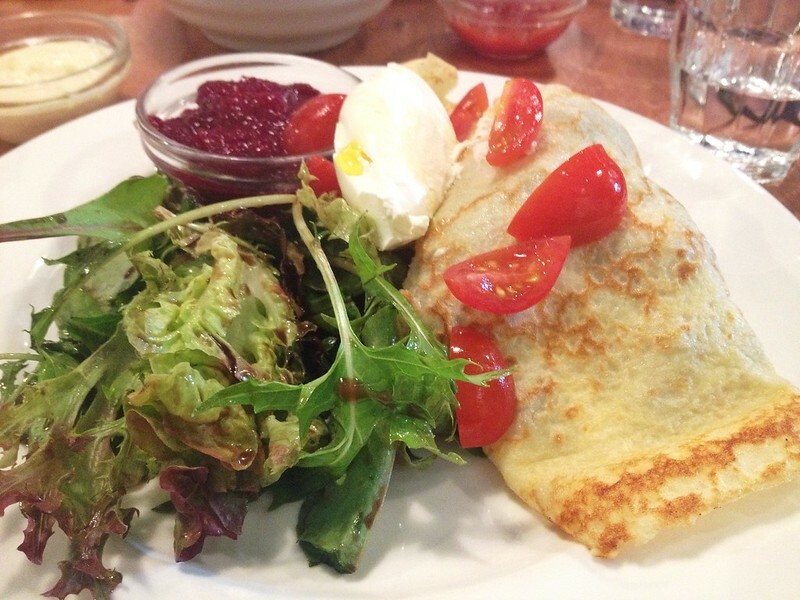 Fluffy Savoury Crêpes (S$12.50 + S$3.50 for sautéed mushrooms + S$4.50 for smoked salmon) || Served with Mozzarella, sour cream, beet root relish, and mixed greens. Omg I only realise it now when I am typing this that we paid so much for this! They were good, but so overpriced for crêpes! Very generous fillings - I don't expect less because the price is :O The beet root relish was refreshing too. Other add-ons include bacon, avocado, parma ham, etc. 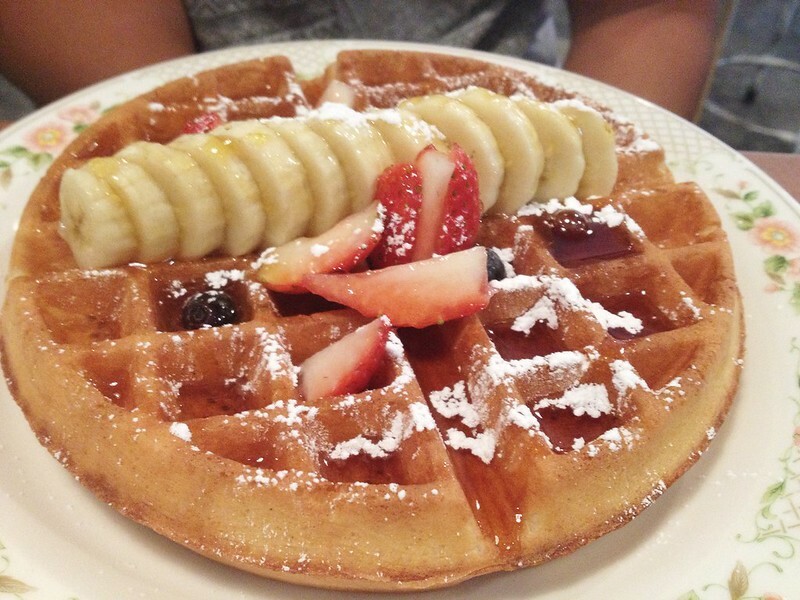 Buttermilk Waffles with Maple Syrup and Fresh Fruit (S$11.90) || I really like the waffles here! 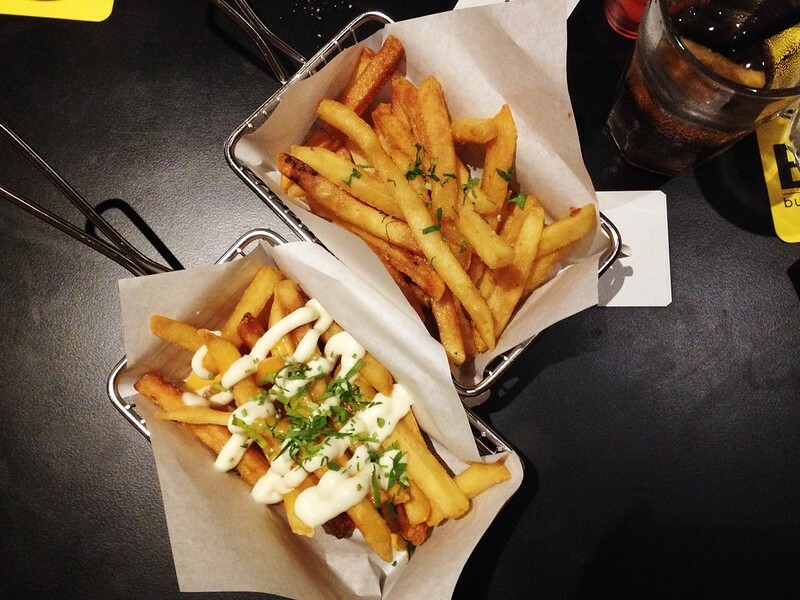 After lunch at Strangers' Reunion, we had dinner at Habitat because it's so near his house and we wanted to try their truffle fries and poutine! 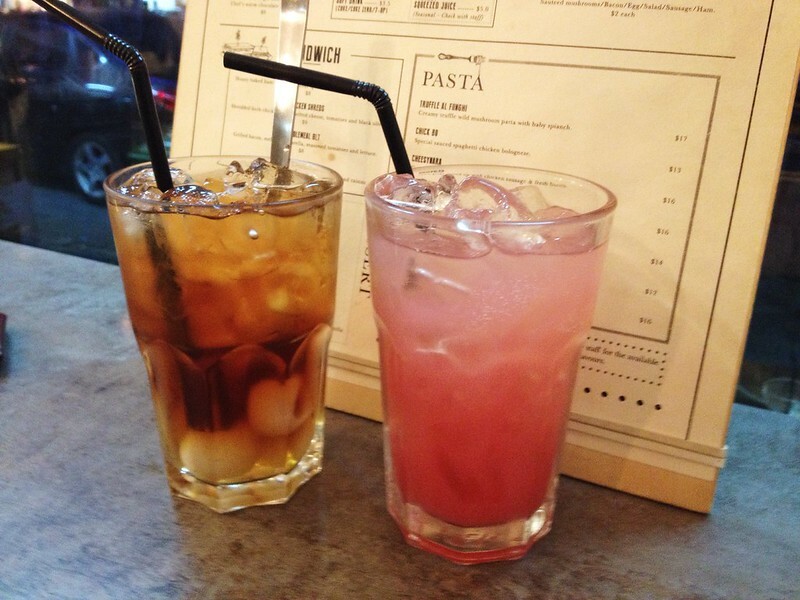 Habitat Fusion Longan Tea (S$4.90) and Guava Juice Soda (S$4). 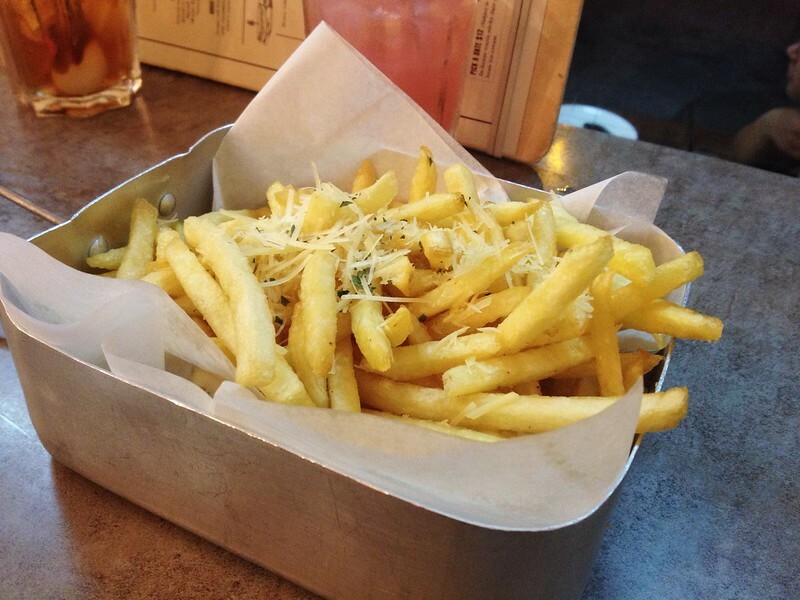 Hello Truffle (S$8) || Home seasoned truffle fries, dressed with fine grated parmesan. I wouldn't say it was bad, but it paled in comparison to the one at Strangers' Reunion. Maybe too much truffle fries that day! 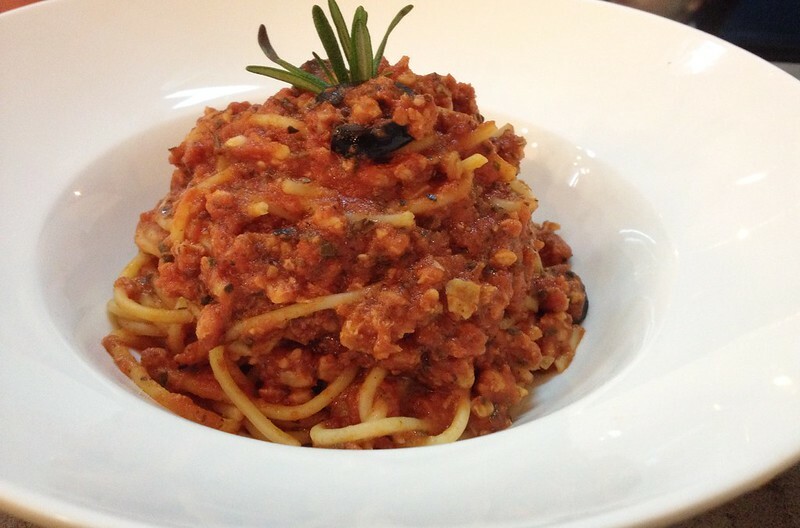 Chick Bo || Special sauced spaghetti chicken bolognese. 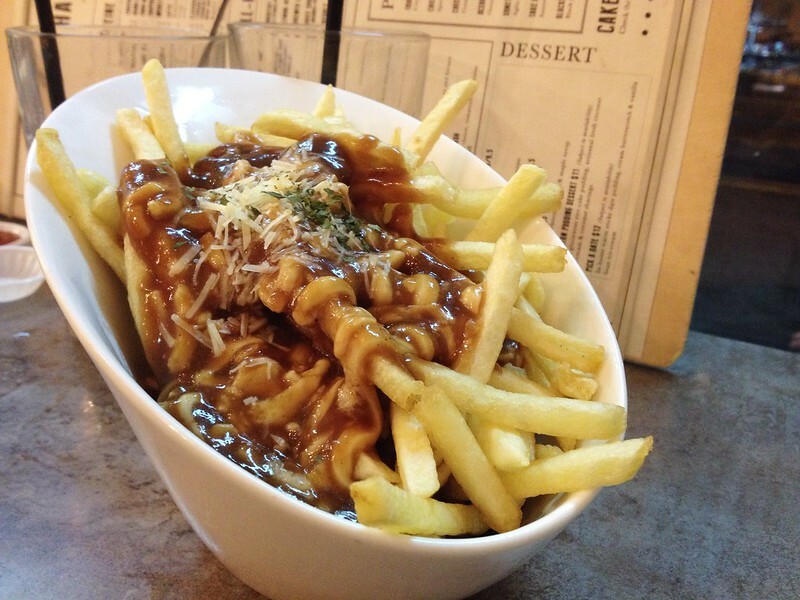 Poutine (S$8) || Fries topped with homemade brown gravy and cheese. 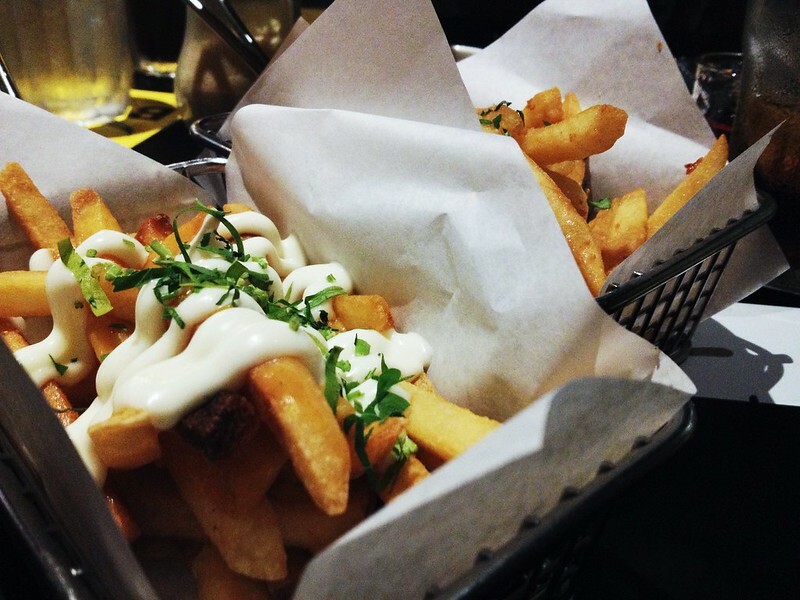 Yup fries again. 3rd serving of fries on the same day!